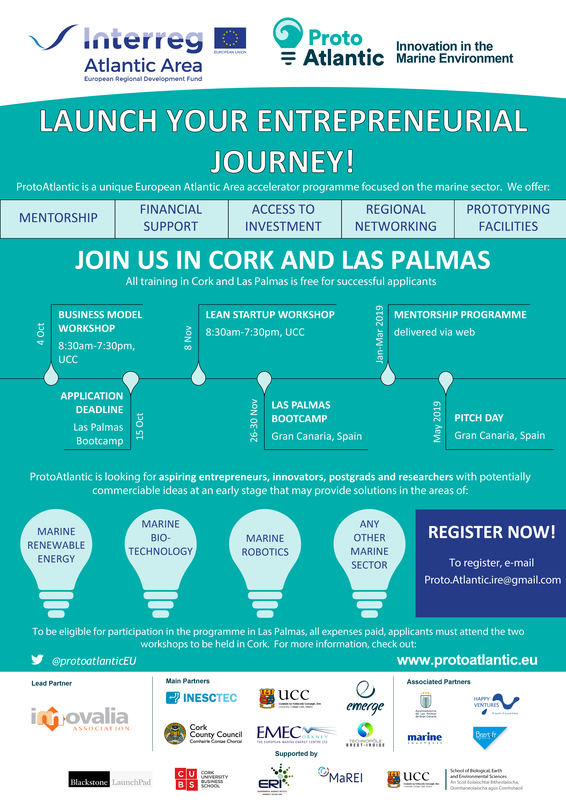 Launch your entreprenurial journey with ProtoAtlantic in Cork! ProtoAtlantic is looking for aspiring entrepreneurs, innovators, postgrads and researchers with potentially commerciable ideas at an early stage that may provide solutions in the areas of; marine renewable energy; marine bio-technology; marine robotics, or; any other product relating to the marine sector. The first ProtoAtlantic workshop for Cork will be taking place on Thursday 4th October 2018 in University College Cork between 08:30-19:30. This workshop will address the business model of the company, and will be delivered by Peter Finnegan and Lawrence Dooley. Interested in attending? Email Proto.Atlantic.ire@gmail.com to register your interest. Further information about the ProtoAtlantic Accelerator Program can be found here.